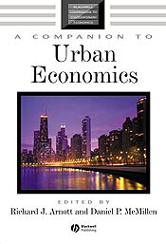 Editor/Author Arnott, Richard J. and McMillen, Daniel P.
A Companion to Urban Economics provides a state-of-the-art overview of this field, communicating its intellectual richness through a diverse portfolio of authors and topics. Unique in both its rigor and international treatment. An ideal supplementary textbook in upper-level undergraduate urban economics courses, or in master's level and professional courses, providing students with the necessary foundation to tackle more advanced topics in urban economics. Contains contributions from the world's leading urban economists.